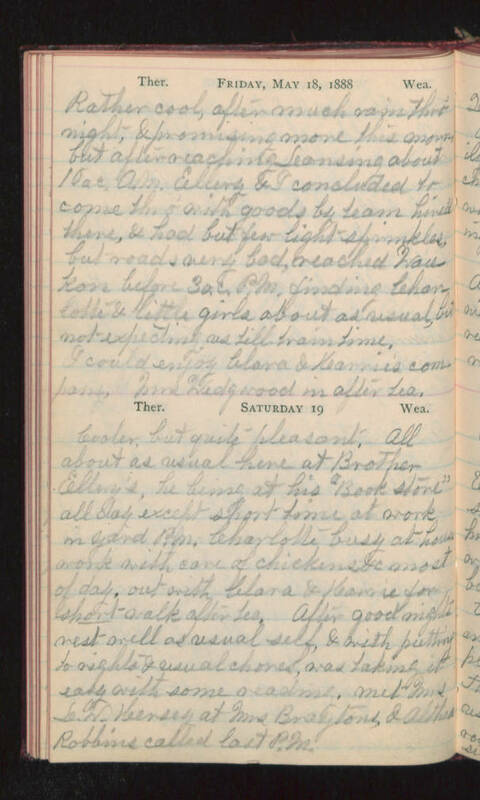 Friday, May 18, 1888 Rather cool, after much rain thro' night, & promising more this morn, but after reaching Lansing about 10 o.c, A.M. Ellery & I concluded to come thro' with goods by team hired there, & had but few light sprinkles, but roads very bad, reached Waukon before 3 o.c. P.M. finding Charlotte & little girls about as usual, but not expecting us till train time. I could enjoy Clara & Karrie's company, Mrs Wedgewood in after tea. Saturday 19 Cooler, but quite pleasant. All about as usual here at Brother Ellery's, he being at his "Book store" all day except short time at work in yard P.M. Charlotte busy at house work with care of chickens &c most of day, out with Clara & Karrie for short walk after tea. After good nights rest well as usual self, & with putting to rights & usual chores, was taking it easy with some reading, met Mrs L. W. Hensey at Mrs Braytons & Althea Robbins called last P.M.